We had a retreat at church this weekend for those of us in the Worship and Creative Arts Ministry. God showed me something very interesting about myself, and I can't help but share it with you fine people. One of the exercises we did was an hour of silence and solitude. Time to spend encountering God. In silence. And solitude. An hour. It wasn't because I was bored. I wasn't. We were given some exercises to do—visualizations, Lectio Devina, intercessional prayer. It was intense. I hadn't really done something like this before. Honestly, by the end of it, I was drained. To the floor, drained. Emotionally, spiritually. So I wasn't bored, I was exhausted. What God revealed to me is this: I have very little idea who I am. I have always been told what I am by other people. A few nice things: I have book smarts, I have good intentions, I'm a good mom, I'm a good wife, I'm a good actor/dancer. But more not-so-nice things: I have no common sense, I don't say anything useful, I'm lazy, I'm an airhead, I'm mean, I can't sing, I can't take care of money, etc. Some of these things came from close people, like family members. Others came from friends and acquaintances along the way. I have very few opinions about myself, really. Instead, I take what other people say about me and apply it as if it were truth. Then I make some other assumptions (i.e., "Oh, she must think I'm a dummy for saying that. I'm a dummy.") and apply those as well. I try so hard to get out from under the weight of these perceptions (or misconceptions) that I come off as—well, trying too hard. I do end up saying dumb things because I'm trying to impress people. I'm trying to be a better me than the one that exists. But I've realized I need to get away from this thinking. I need to get to what God thinks of me. All these people from my past will pass away, as will their thoughts and ideas---including what they think of me and who they think I am. But God is permanent. His ideas are staying around for eternity. What he thinks matters, and it should matter more to me. So now I need to figure out who God made me to be and get out from under the pressure of my past and who I've tried to be. And I guess I need to start from scratch. I'm not sure how to do that. Anyone else been in the same boat? Because I'm going down with the ship and resurfacing as The Rachel God Made Me to Be. I am absolutely in the same boat. I spend way too much responding to the me I think other people think I am, and next to no time being the me I am. Confusing, I know. 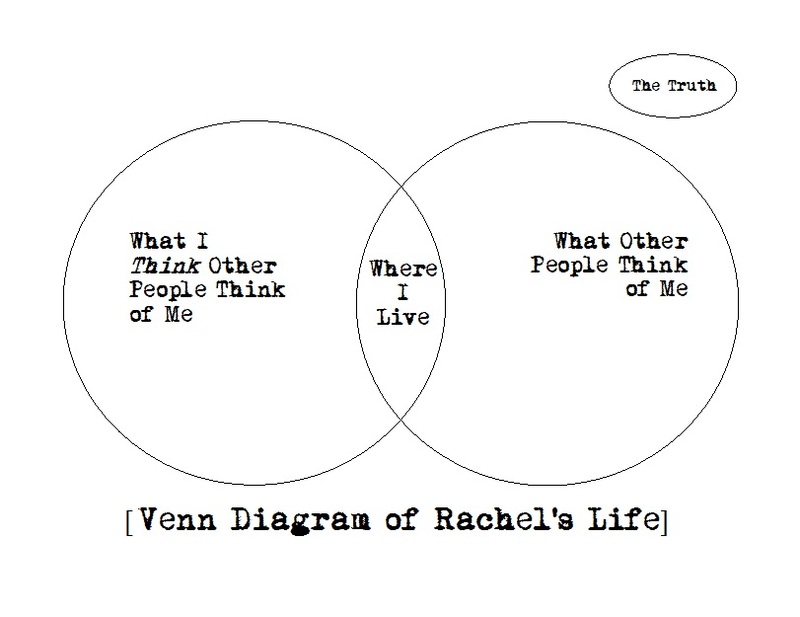 But your Venn diagram sums it up perfectly. Joural - and not just your prayers, but actually have conversations with God. Read Donna Partow's "Being the Woman God Made me to Be". It's a 90 day study that will help reveal who you are. (or becoming the woman... can't rememer the exact title). Great thoughts girlie! We just discussed something similar at church Sunday - how we react and not allowing our emotions to dictate us, but having the wisdom to follow God's truth in our life. I am an emotional person so this is an area I really need to work on! :) I love that you had quiet time to hear His words! 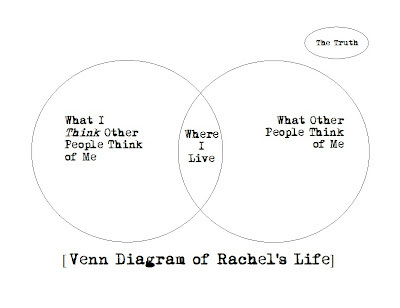 Oh, how sad, to plot your life out on a Venn Diagram .. just sounds all kinds of wrong! But being the person God intends you to be, that intentional living, that thinking less of what others think and more of thinking for yourself ... now that I can get behind. Good luck with your journey of the new you, self discovery ... you go girl! Wow Rachel! 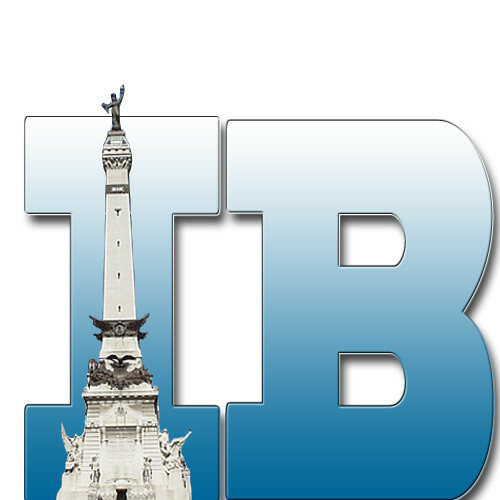 I stumbled upon your blog through a series of other blogs, and I am so glad I did! I am on the same boat. Paying way to much attention to what others may or may not think of me. You said that "All these people from my past will pass away, as will their thoughts and ideas---including what they think of me and who they think I am. But God is permanent. His ideas are staying around for eternity. What he thinks matters, and it should matter more to me," and that's so true. I know I have to hold on to that second part. It's so hard to do sometimes. I did a retreat once that required a whole night of silence. It was challenging, and like you said, exhausting. The world conditions us from a young age to care very much about what others think. It's such a hard habit to break! But must be so freeing for those who have achieved it. I am not there yet! One thing popped out to me. You said, "I need to get to what God thinks of me." I want you to know that you already have the answer. I can tell you what God thinks of you. He loves you. He loves you as He created you, He loves you as you are, where you are. As long as you take that love and put it into action, you're fine. There doesn't have to be a definition that you live into. You are a child of God who is loved beyond description. That's who you are. I spent Saturday at a ladies retreat that focused on our freedom in Christ. One of the things the speaker said that helped me is that we need to run through life with "spiritual blinders" on so we can forget those who have negative things to say about us. If we are focused squarely on the King of Kings, we won't stumble in what others think of us, or what we think others think of us. A much needed idea for me because I do worry way too much about what people think of me!! Good post! I struggle with this a lot- b/c people want to make assumptions about me based on things that aren't really me. But, I think I've gotten to a place where I know who I am and am comfortable with that. Even if it means that I have to deal with wrong assumptions about me. I love what you are doing and this journey. I think we all struggle with believing and living the words other people put on us and forget to find out what God believes of us. It's a battle but I know you will win it. WOnderful that you are ready to query too! I think everyone's earthy self is a sum of their experiences. I think it's amazing that you are on this search for the REAL you! I've definitely been there! For so long my self-esteem and self-worth was based on what others said or what I thought they believed. I worked through a lot of those issues but it wasn't until a few years ago that I realized that God didn't make any mistakes when He made me. No, I'm not perfect but I'm exactly the person He created me to be. That greatly impacted my sense of who I am. When I focus on God's opinion, the rest falls into place. It's SO HARD to NOT perceive yourself (myself) through the eyes of other people! I would bet this is probably true for A LOT of women. Great post! VERY ENCOURAGING! You rock! Wow, Rachel, that's intense and thought-provoking. GREAT post! I've been struggling with this exact thing especially this past week! I know who I am and I know who God knows me as and that is all that really matters. When "they" say that God meets us where we're at, we usually hear it but don't really believe it. Sounds like you're on your way to believing it and learning to live where you're at, with God.